It is generally believed that alien beings are armed with technology far more advanced than that which us as mere earthlings possess, however, with the large number of U.F.O’s reportedly having crashed to earth over the years, it would not be unreasonable to presume that it is the aliens, and not us, who would benefit most from the sharing of technological advancements in the field of aviation. Alien spaceships are reported to have crash landed all over this world of ours, so it is not beyond the realms of possibility that one day you could awake, to find that a glimmering Martian saucer has nose dived and come to a halt within your own back yard. 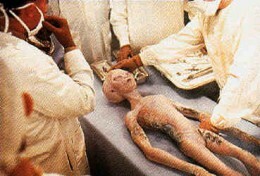 Setting aside the complications associated with trying to obtain planning permission for converting your residence into an alien research centre, alien autopsy can be an extremely enjoyable way to pass a few hours, and may reveal extremely beneficial (and profitable) biological data regarding the alien anatomy. So don a white coat and rubber gloves, lay down your mum’s best sheets and grab a steak knife from the drawer, it’s time to unleash the secrets of extraterrestrial life. First things first, it's important to conduct your alien autopsy with both seriousness and respect for the alien cadaver, it's not wrong that you're enjoying yourself, but it is important to remember that the alien autopsy's primary purpose is one of curiosity and scientific interest. OK, so you've composed yourself and accepted the enormity of the task at hand and you're ready to begin. The first step to conducting your alien autopsy successfully is to examine the outside of the alien's body; much can be learned from this part of the examination. Measurements are taken and recorded of the external anatomy and the body will need to be weighed and pictures taken of any wounds or marks. The second step to conducting a successful alien autopsy is to create a ‘Y’ shaped incision all the way from the shoulders to the middle of the chest, then carry the incision down towards the pubic-bone. A second incision then needs to be made at the back of the head, just below and behind the ears. In order to gain full access into the alien cadaver additional incisions should be made into the skull, rib-cage, abdominal cavity and the breast bone. You should now be able to stretch open the scalp and front chest for internal inspection. The next step to conducting a thorough alien autopsy is to open the skull and all other body cavities, inspect all internal organs thoroughly, making notes of any significant observations, then remove the internal organs and weigh them, including the brain. Microscopic examination of tissue must then be carried out and all results are recorded on a voice recorder for later transcription. Place slivers of each organ in preservation fluid and save for later microscopic laboratory examination. You've just completed your very first alien autopsy, go make yourself something nice to eat in way of celebration, you’ve earned it, but do be sure to wash your hands first. An UFO has just crash-landed in my back yard. I want to perform the autopsy, but how do I find out if the alien is dead from a distance? I got all A's in biology, I was the only kid in my class to get the frog's brain out, intact. I do think I would be a good alien coroner. brilliant, and entertaining, though instead of waiting for one to crash, I've decided to shoot one down and take matters into my own hand so to speak. Those pics are nothing but some shaved crackheads from around the block! Give me $5 bucks and I'll get you a couple (shhh...our little secret, um-kay?) You just gave me a wacky prank to pull on the kiddies when they come around for some treats...Boy have I got one for THEM! Aliens are consummate surfers of the intergalactic super highway. I believe that crash landings are an oversight, probably caused by too much giggling and not enough attention being paid to the knobs, buttons and LED dashboard lights. An alien autopsy is gross, IMO. Lots of goooooooo and undesirable ... bits. I hope Pacal didn't sustain any injuries during his investigations. I heard that in Eastern Europe, Bulgaria, an ancient alian has been found and it was hermaphrodite. However, the project was a top military secret and it has been shut down. The alian has been found beneath the ground near the city of Varna. Russian experts and sensetives were there to confirm and investigate the case. however, what they discivered was that it was alive but was sleeping in a capsule. They suggested that it may awake and wstart reproducing itself.. and maybe this was the reason for shutting down the project.. Do you think that if alian investigation and dissection is dngerous for people it should be cesead in the sake of international security? Ah, I am ever fascinated by the clumsy stellar travelers who plummet so frequently from the heavens. In my day the barbers would manage the post-mortems of the blundering aeronauts.